Jordan Hamilton sets up for a shot. The sophomore guard returned from injury but came off the bench in Thursday’s loss. When Minnesota coach Lindsay Whalen took on Northwestern during her collegiate career over a decade ago, she thoroughly dominated her conference opponent, winning all seven matchups. 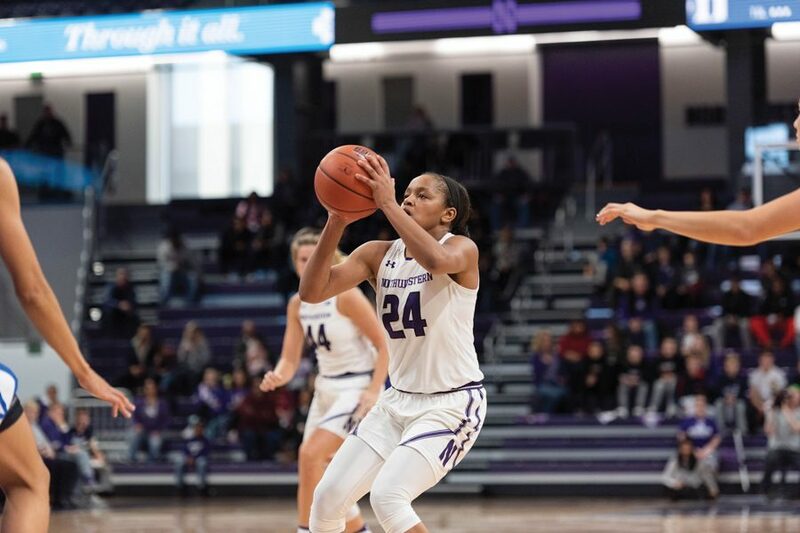 With Whalen making her first coaching appearance against the Wildcats on Thursday night, NU looked to turn over a new leaf against the former WNBA star — but the Cats turned the ball over instead. The Golden Gophers (14-7, 3-7 Big Ten) three-quarter court press caused NU (13-8, 6-4) to look frazzled offensively in a 61-54 home loss. Junior forward Abi Scheid missed another game with an undisclosed injury, and sophomore guard Jordan Hamilton came off of the bench as she was eased back into action from an injury of her own. The Cats finished with 18 turnovers, their second-most of the season, including 9 giveaways in the first quarter alone, as the deadly Minnesota guard duo of Kenisha Bell and Jasmine Brunson wreaked havoc with their agility and court awareness. Freshman guard Veronica Burton, who scored 13 points for NU, said Minnesota’s effective defenders and constant ball pressure wasn’t something the team was accustomed to, forcing the team to adjust throughout the game. While she said the team improved in taking care of the ball after the first quarter, the struggles in the first half proved insurmountable. The Cats also saw their share of struggles from 3-point range, attempting only seven shots from beyond the arc. The team’s only make was a heave from Burton at the end of the third quarter from the half-court logo. The Golden Gophers rode to victory on the backs of their guards, specifically Bell – Minnesota’s leading scorer. She repeatedly burned the Wildcats on explosive drives to the basket against whoever was guarding her. Burton was expecting it to be tough to defend her coming into the matchup since Bell is one of the most talented scorers in the conference . The loss snapped NU’s four-game winning streak, and the home defeat to the bottom-dwelling Big Ten foe is certainly a blow to any potential NCAA Tournament hopes. Although at one point Minnesota was ranked No. 12 in the country, the Golden Gophers came into the game reeling, losers of their past three and playing their third game in six days.